by Carey Finn (@carey_finn) Historically, 1886 has flown under the radar but the ad agency is starting to share its stories in a bid to boost brand awareness. Key among them are its work on the recent Cell C brand and corporate identity shift, as well as the agency’s own new CI, and its ethos of fun, fast creative work. A wholly owned subsidiary of the FCB Africa group, 1886 is a fully fledged, standalone agency operating out of Joburg since 2012, with its own strategy, operation teams and clients. Executive vice president, Derek Coles, says it was set up as “a separate shop” able to handle conflict pieces of business. The agency has done “reasonably well” over the years, he says, reporting revenue growth of upwards of 50% over the past three. Front and centre of the agency’s work in 2018 is its collaboration with Cell C on the telco company’s new look — both internal and external. Following its recapitalisation in December last year, which sees the shareholding restructured to include employees, Cell C started rolling out its revised brand identity, which has seen its colours become orange and purple and its payoff line change to “Connect your way”, with the help of 1886. Coles says that Cell C was looking to modernise its brand, and make it more relevant and accessible to consumers. With concern that Cell C’s previous colours may have been a bit recessive, particularly in the retail space, 1886 was tasked with helping it to stand out better in the market. Chief creative officer, Stuart Stobbs, says that they had to “modernise, simplify and orangify” the brand, and feels that seeding the changes slowly has helped the new identity to be well-received and viewed as an evolution, rather than a radical new identity. Coles adds that, by avoiding the “lightswitch” approach that characterises some rebranding efforts, the agency was able to use resources differently. “The aim was to spend money more in the product space and retail space, in the brand space from another point of view, and not just on telling people we changed the colour,” he says. When it came to the new payoff line, says Coles, the idea was “to move towards what consumers are looking for, especially in the data space, knowing that millennials and Afrollennials are keen to be able to use data to connect with whoever they want, in the way they want.” The “Connect your way” phrase was initially brought in as a campaign line that started appearing across materials before its launch at the end of last year. 1886 has seen other success with the Cell C brand: the awarding of a Silver Lion for its C Surance radio ads and a Merit at the One Show this year. It’s also garnered attention with its recent “Food Baby” campaign for Steers, whose lead agency it has been for over two years, says Stobbs. Other major brands include Nivea (Beiersdorf), which was the agency’s first-ever client, Sasfin Bank and Easy Waves. Key to growth has been the agency’s business model, which, says Stobbs, is the pace and flexibility with which it operates. “The pace of advertising has always been fast, but it’s accelerated to an almost-ridiculous level,” he says. Taking the need for speed into account, 1886’s creative workflow typically involves an initial brainstorm with a client “to get an idea of where they’re going,” with sufficient numbers of senior team members involved to effectively interrogate the brief. This is followed by what Stobbs calls “bullet brainstorms”, where ideas are fired off rapidly within a deliberately constrained time period. After these, the best suggestions are sent for approval and further development. The agency is gearing up for a couple of shifts, one of which will see Stobbs and Coles step back from day-to-day operations “a little bit” to focus on growing the business. To this end, they welcomed Terry Unser, who was previously executive business director, back, after a stint at Alpha Investment Group, in the capacity of executive director: integrated business in April. The increase of Gareth Lessing’s commitment from freelance to full time in the capacity of ECD under Stobbs last year was another decision made with this role refocus in mind, as was the recent re-onboarding of Brendo-lee Tobias, who has returned to the fold to take care of operations as creative services manager. 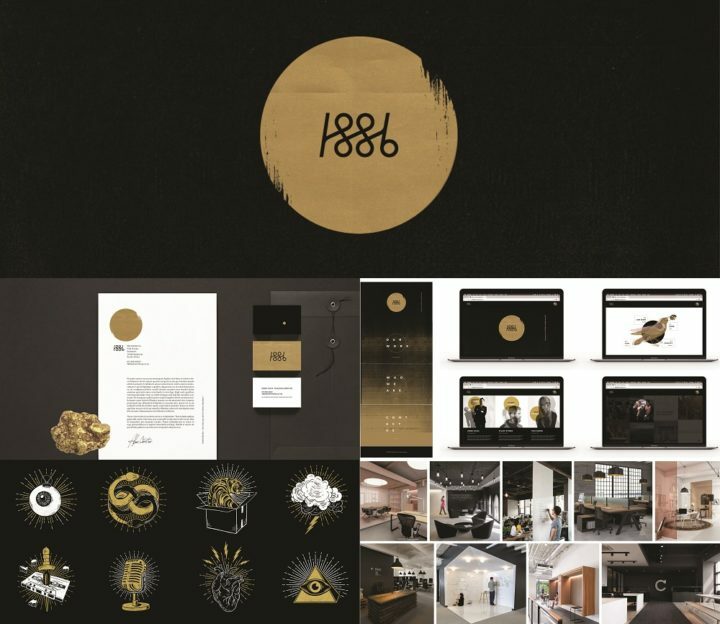 The agency’s new colour scheme is gold and black, with the former reflecting the value that can be built out of a brand, like a gold nugget, he says. He adds that, in its work, 1886 will be focusing on three things: data, storytelling and emotion. “If we can get those right, we’ll be able to find the nuggets and do some amazing stuff,” he says. In this vein, the agency now encourages the people it works with to be ‘AuSome’.